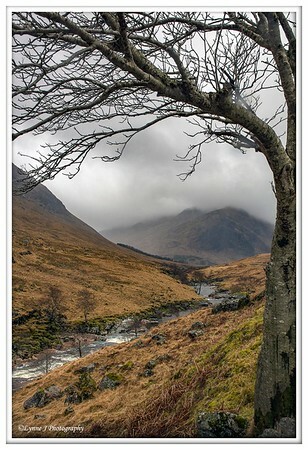 15 photography nutters , 4 days , Glencoe .......this was promising to be an amazing meet ! Planning started some 6 months before , accommodation was booked at the Blackwater Hostel in Kinlochleven , car sharing was organised , endless hours were spent on Google Maps scouting locations & as we were all based in different areas of the country , a Whatsapp Chat was set up . This allowed for much giddiness , banter & sharing of items needing to be purchased for the trip which in turn resulted , I suspect , in a huge upturn in profit for several outdoorsy type stores across the country ! Each of us had our own list of MUST visit places so the itinerary was loose , flexible & very much weather dependant...this is Scotland afterall . As is customary on these meets I collected Andy from Leeds at 6am & we headed off to the Llama Karma Cafe in Brougham to meet up with a few others , Dan , Adrian, Mark & Rich & take advantage of a hot cooked breakfast as food ( & sleep ) are secondary considerations on these meets . 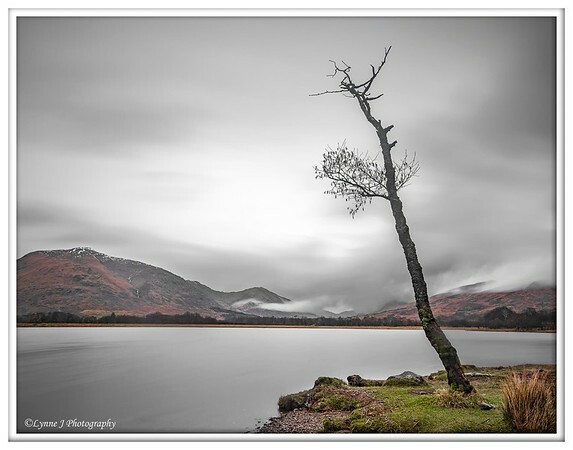 The weather at this point wasn't looking to bad but we knew it was going to be "changeable" over the weekend so fairly quickly we all headed off , Andy & myself to Milarocchy Bay , the others toward Loch Earn to see the Mirror Man statue . 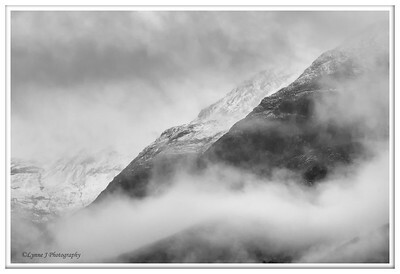 As we drove along the wonderfully twisting & sweeping Scottish roads a sudden burst of sunshine over mountains to my right saw me pull over to the kerb & grab the camera.....I was going to get a shot if it killed me ! By the time we reached the Bay the weather had indeed changed , in to rain & mist ( we couldn't see the hills on the far side of the bay ! ) which prevented any photography but allowed us to confirm we would be coming home via this place as the tree had huge potential in decent weather conditions . Phone signal was somewhat sporadic but we did manage to speak to the others only to find out that Mirror Man was no longer there , it was also raining at Loch Earn & they were going in search of waterfalls . As we weren't far behind them we arranged to meet in one of the carparks at Loch Earn & head off in convoy . Loch Achtriochtan held more appeal than a waterfall today so Andy & I split from the others & headed off , stopping off briefly on the roadside near Blackrock Cottage to see what photo opportunities the location offered using the Glen Etive river & surrounding mountains . Plenty of scope for a good weather day , however the rain & mist persisted so back to the car but not before the hailstorm arrived.....those things sting ! A little further along the A82 & we pulled in to Achtriochtan carpark , still in the mist & rain but there were signs that it was starting to ease a little just as the others appeared from the waterfalls . A quick chat & they headed off to the hostel to get checked in & we headed off to find Torren Lochan which was approx 10 mins away . We'd just starting packing up when right on cue the rain returned so , having got all the images we wanted we set about deciding on a location for sunset . 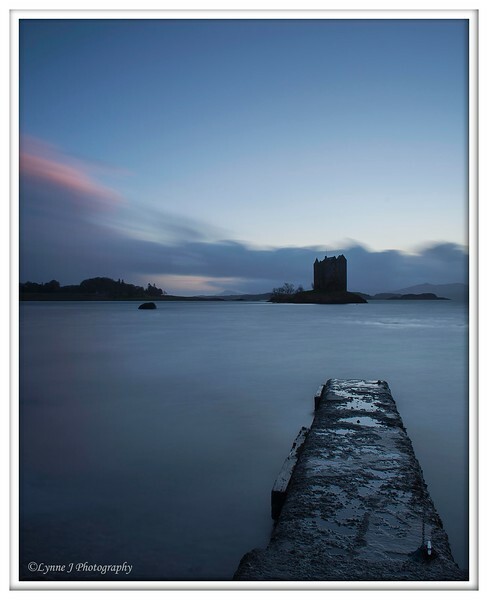 We managed to get a phone signal , arranged to meet the others at Castle Stalker which seemed to be promising the best light ( or rather , the least amount of rain ) & some 30 minutes later pulled in to the car park to join them. Toby & Paul had also arrived so in all there was I think , 8 of us , wandering along the waters front of Loch Linnhe , all searching for The composition & praying for a sunset whist watching menacing black clouds looming in the distance ! 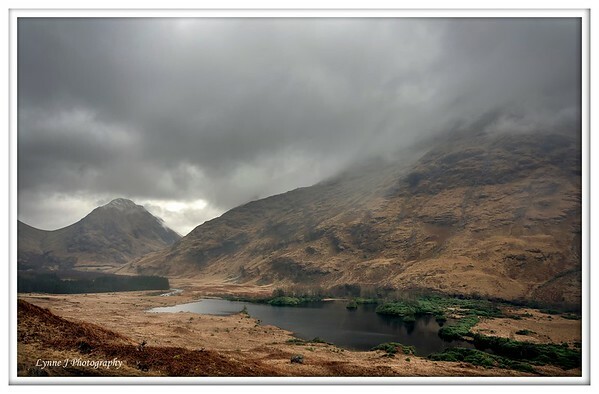 We struck lucky for the 2nd time & for around 20-30 mins the ominous clouds skirted around the Loch , the rain stayed away & we managed to capture some great images . We were by now all starting to feel a tad hungry & tired so off to the hostel to unpack , meet the rest of the guys , eat , gossip & plan tomorrows adventure . The weather forecast showed rain , rain & more rain , all day , no breaks ...not quite what we'd hoped for but hey ho , such is life ! 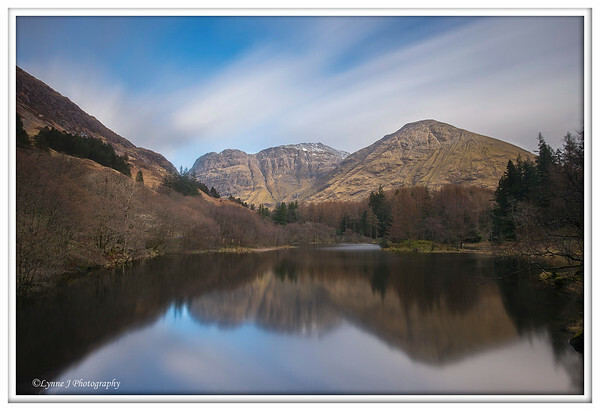 After much debating 5 of us decided to stay local & visit Glencoe Lochan which , if we did get a weather break , would afford us some lovely opportunities of snow capped mountains & reflections . Alarms were duly set for 5am , we were going to make the most of the trip irrespective of what Scotland would throw at us in terms of weather . The hostel came alive to the sound of alarm clocks & excited hushed mutterings as we brewed tea & ate breakfast before venturing out for sunrise a little after 5.30am . Ever optimistic we drove in convoy back along the empty winding road that runs high above & almost the full length of Loch Leven , trying to ignore the rain & keep our spirits high . Over the single lane bridge in Ballachulish , hook a left , past rows of houses & cottages , up a side lane & finally into the car park at Glencoe Lochan where the rain seemed to ease a little . 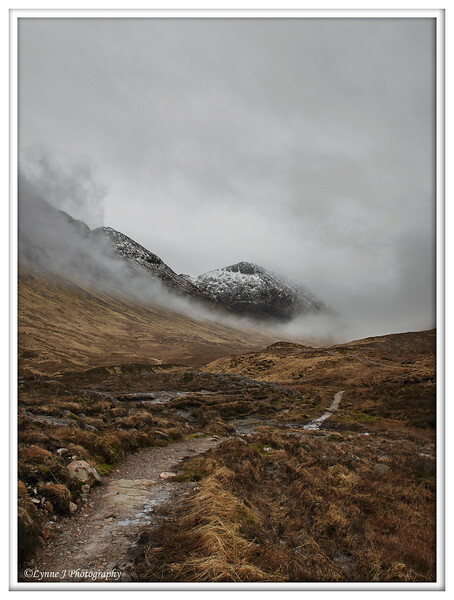 We followed one of the paths on a short 5 minute walk up to the Lochan & went our separate ways to explore possible compositions should the rain & mist decide to afford us a break . 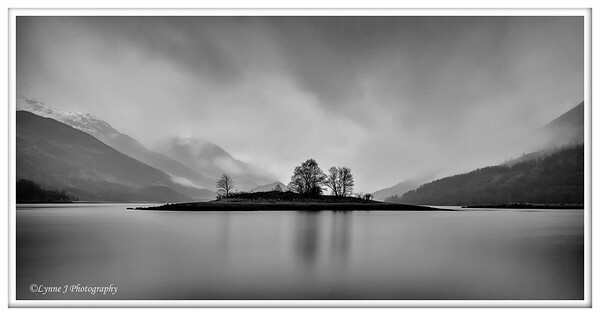 Even in these less than favourable conditions we could see the possibilities - several small islands in the lochan , a few wooden jetty's on both sides , the Pap of Glencoe with its snow covered peak just visible through the mist above the trees & from each end a perfect view down the tree lined lochan which would give stunning reflections....if only it wasn't raining & misty ! Realising that The photo would not happen I ventured off in to the woods , searching for inspiration , looking for the smaller detail that would make a interesting image on this dull wet day . I've been watching a lot of vlogs by a certain Mr Heaton & it was due to him that I stopped & thought about the detail instead of packing up & going back to the hostel which would have been the much easier option . 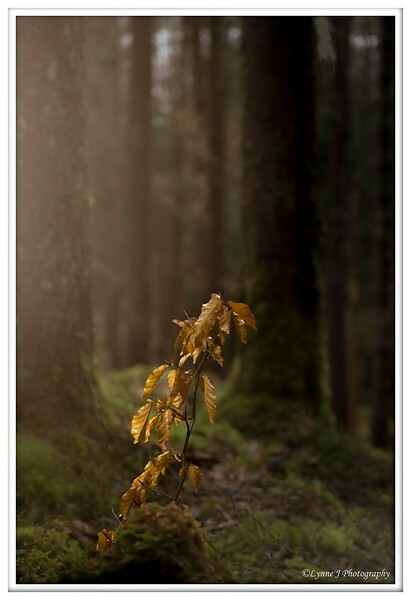 Eventually I spotted a small tree , more an off shoot of a larger tree , with lovely goldy brown leaves nestled at the foot of the towering Pine trees & surrounded by rich green moss . An image formed in my head & I knew exactly how I wanted it to look . I positioned the tripod down low , set the camera at f2.8 ( shallow depth of field ) which allowed the little tree to be the star of the image whilst allowing enough of the background to be visible , so as to add context to the shot . An exposure time of 1/10th second at iso100 & exposure compensation set at -2 to further darken the image I then lit the tree with my head torch . 2 shots & I had exactly what I'd envisaged & a very large smile on my face . This was something of a turning point for me & set the tone for the rest of my weekend . 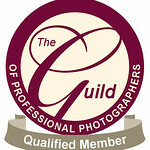 I knew then that I could make a great image even without the good weather that we'd hoped for . We regrouped & went back to the hostel for a quick dry out & discussion on where to go for the rest of the day . Myself , Paul , Andy & Ian were joined at the hostel by Mark & his daughter Issy & rather than sit around bemoaning the weather & spending all day on the web in the comfort & dryness of the hostel we decided to head out around the shores of Loch Leven & do some exploring . Initially we were going to walk but on discovering it was approx 15miles just to get to where we wanted to be we opted to drive ! The 1st stop was to be a waterfall but we got slightly distracted by the view that opened up down the Loch as we rounded a corner & as there was a conveniently located layby it seemed rude not to stop & see what we could get . I'd decided that with the lack of good light & color any images I took would need to be suitable for converting to mono & so another learning curve was started . The rain eased for about 10 mins allowing just enough time to find a composition I liked & then it was back in the car to continue the drive in search of other locations . This also allowed for gloves to be dried in the warm air of the car heater & for bodies to warm up a little , it wasn't particularly cold but the constant dampness soon started to chill you . 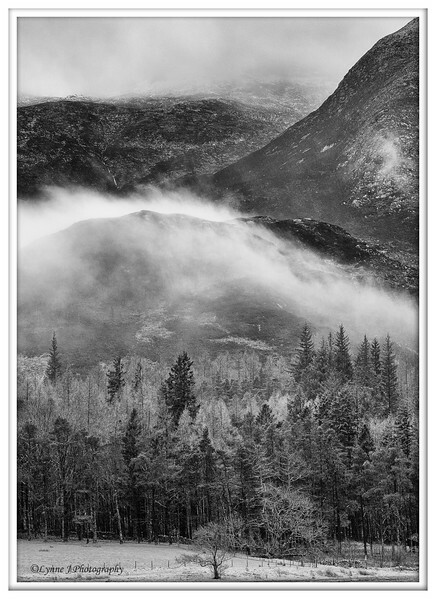 The rolling mist became quite mesmerising to watch , dark mountain tops & slopes being hidden then emerging seconds or minutes later as it swirled , draping itself almost cloak like , over the landscape creating an almost ethereal feel . I decided to put the 70-200mm lens to use ( another learning curve ) , lens hood on as filters weren't needed & it shielded the front element from the misty rain , upped the ISO to 500 to allow me to shoot without the tripod & snapped away for a good hour . I never thought I'd say it but I really enjoyed that time , pushing myself to find images where at first glance , to me at least , there were no images to be had . 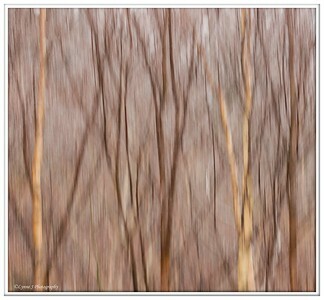 Whilst waiting for Andy I also tried out ICM ( Intentional Camera Movement ) on a few of the trees still using the 70-200mm & again was surprised at how well they turned out...every day's a school day ! Eventually Andy re-appeared from up high , happy with his shots so we drove down to a little seafood restaurant to meet the others & have a cuppa to warm up & make a judgement call on sunset . It was nearing 5 o'clock & with the mist & rain showing no sign of letting up we figured sunset would be a non event . Decision made , back to base for tea followed by a few beers a & good long gossip with all the others about the day along with sorting out the plans for sunrise the following morning . Most importantly though we needed to dry ourselves & our kit out . My rucksack had taken on probably it's own weight in water , lenses & filters were wet & needing a good clean & cleaning cloths needed a few hours on the radiator . I vaguely heard Andy's alarm sound at about 4am , a group of the guys had decided to hike up a mountain for sunrise for a specific shot across the valley . I had decided that staying in bed for an extra hour was a far more sensible idea ! 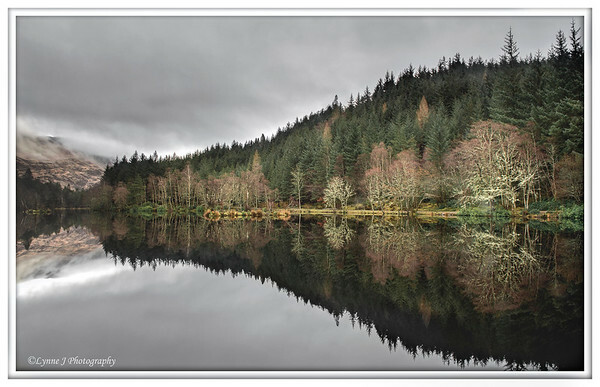 My plan was to revisit Glencoe Lochan as the weather forecast was looking much better than yesterday....no rain & that in itself was perfect news . I left the hostel around 5.30am , the rest of the guys were heading off in various directions , all of us breathing sighs of relief that it wasn't actually raining . The Lochan was mirror still when I arrived , again there was no-one else about & it did feel a tad odd being there alone but I soon lost myself in the photography .The mist was still rolling across the distant hills , the light was soft & I even saw a glimmer of color in the sunrise , blinked & it was gone . I was due to meet Mark & Izzy around 8.30am at the Etive Mor carpark & time was marching on so as the breeze picked up slightly I headed off , happy with the image I'd taken & already planning a return visit in better weather . 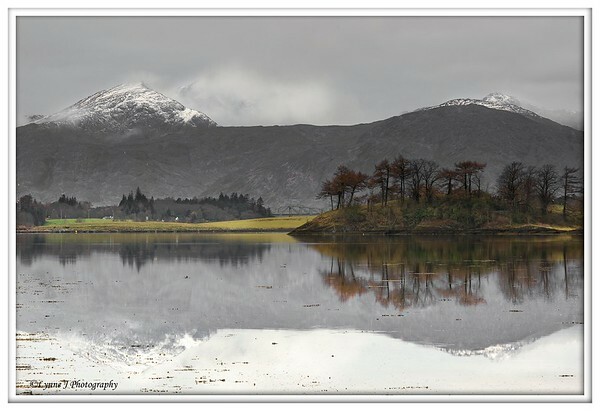 As I turned on the main road I glanced to my right & saw another image opportunity , shooting out across Loch Leven , the snow capped hills in the distance creating a lovely backdrop to a small island that had just a hint of color . 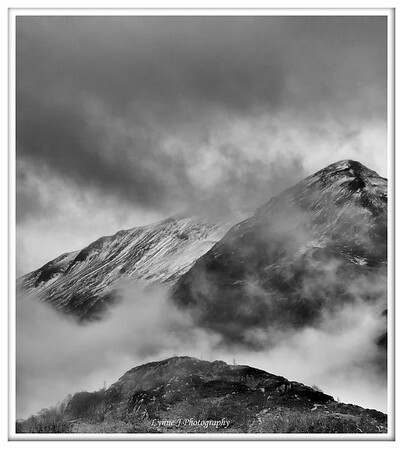 I saw the composition immediately & spent no more than 10 mins there , quite happy that I'd got what I wanted . Back on track I set off o the A82 toward Etive Mor with the intention of stopping just once more for a shot of Lochan Na Fola which I knew was on the road somewhere but I'd failed find on the 2 previous visits to this area . The mist was still hanging around the mountain tops , the rain was absent & the roads were still empty but then it was only about 7.30am on a saturday morning , most sane folk would still be in bed ! I drove past the Lochan a couple of times before finally realising it was there as from the road it looks like a rather large puddle ! Car park found I went for a little wander along a well worn muddy path & met Mark who confirmed the path got muddier further along so I decided to take a shot from my current point as the mist was dropping over the mountains in front of me creating a quite mysterious feel to the place , almost spooky . That done I headed back along the main road , down the embankment & squelched my way across the moss & heather to a suitable spot in front of Stob Deargs little brother which was reflecting quite nicely in the Lochan . On checking the time I knew I didn't have long to spend here so I set about finding a composition to work with . 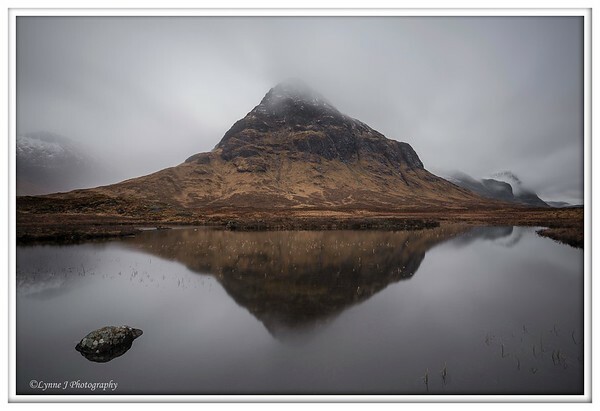 A solitary rock peaked out from the still water to my left , reeds were just starting to poke their heads above the water & the snow capped mountain peaks to either side of Buachaille Etive Beag were just visible amidst the swirling mist . Job done . It may be a classic image & done a million times over but , until this point , it hadn't been shot by me & I now have my own take on the scene . After a chatting for a few minutes we decided to head off & investigate Loch Tullla which was back the other way on the A82 in the direction of home . 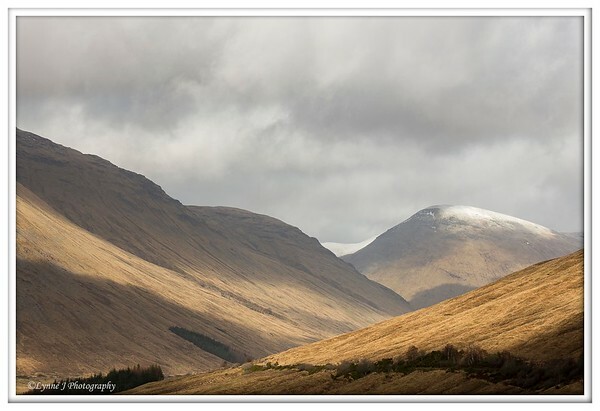 The road was still very empty allowing good progress at a steady pace so we could enjoy the views to either side , small lochans backdropped by mountains with snow on the tops but with the mist coming ever lower we didn't stop . 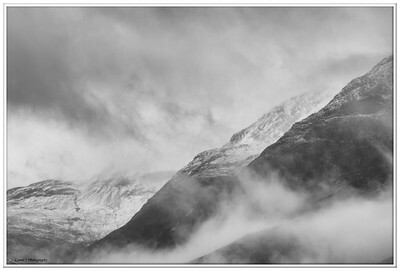 One day we'll get perfect conditions for shooting the Lochan na achlaise but it sure wasn't going to be today . I had a fairly good idea of where we needed to be , the Photographers Guide to Scotland has handy info on locations ( to buy a copy visit Rigu HERE , top customer service ) & I'd spent along while on google maps checking out the area so we found the little road which leads down the far side of the Lochan quite easily , a single track lane with limited passing places & very very few parking spots . Eventually we managed to park up on a verge that seemed firm enough that we wouldn't need towing out , grabbed our gear , waders put on & went through the kissing gate & down toward the waters edge . Andy & the others had rung & were coming to join us having had a fun successful morning on the top of a mountain . By now the mist had swallowed up the distant views , the sky was a bland white mass so detail shots would again be the order of the day . Other than 2 fishermen a little further along the bank the area was deserted although the midges were out , I'd thought I would be safe from them in March ! The walk down to the waters edge was boggy , very boggy , so I picked my way through carefully , the waders doing a great job of keeping me dry but there was always a chance I'd end up on face down in the wet stuff if I stepped in a deep spot ! 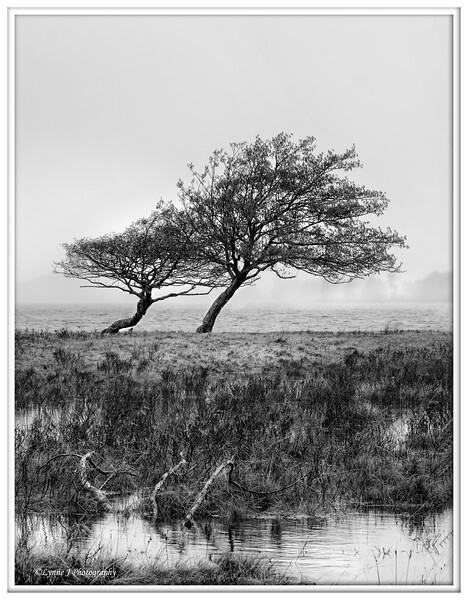 The tree I'd wanted to photograph didn't appeal when I found it , too many smaller bushes around it & no clear view behind it which was a shame but again, in better weather it would offer a couple of good compositions - another place to return to in the future . I made my way across toward a little island as the others arrived , all of them pretty happy with the mornings results & I spotted my shot . 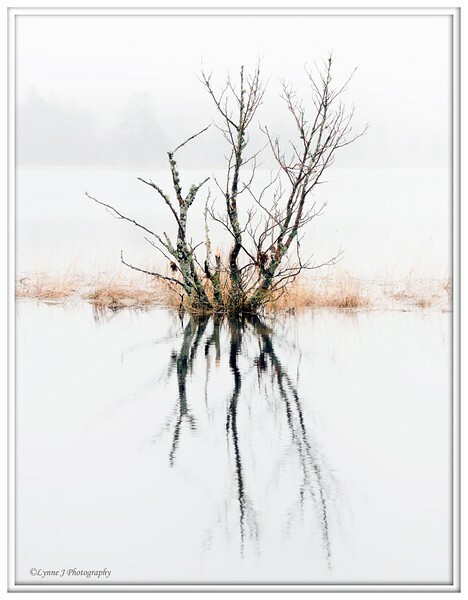 A small bare branched tree out in the water with a line of pale yellow grasses to either side , giving a nice reflection in the still calm water . 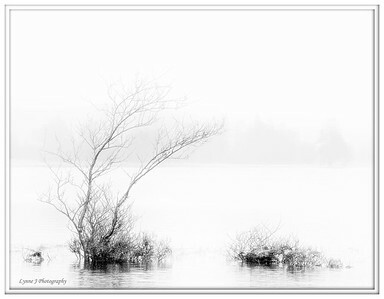 Not my usual image but it appealed in a minimal way so I framed up & took a shot .......having to work for images makes the end result seem sweeter & I was very pleased with how it turned out ,exactly as I'd wanted it . 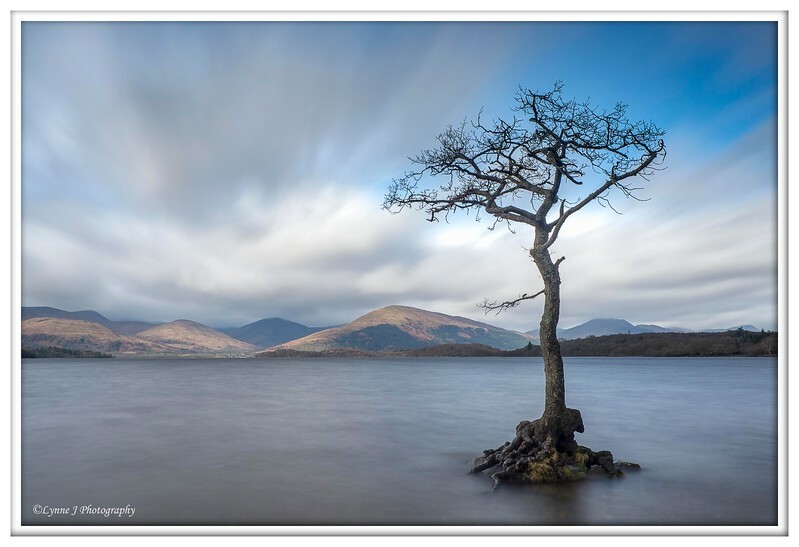 Time for a little vlog ( can be found HERE - my you tube channel )where I had a brain fart & got the name wrong , then it was off , back along the A82 to find the other windswept trees at the far side of the Lochan . Even with the mist & rain trying to spoil the morning myself , Andy & Mark took a wander down into the field , again picking our way though the boggy stuff to grab a few hand held shots before heading off to the Glencoe Mountain resort for a well earned bacon butty & cuppa & a chat about where to go next . It was still only around 10am so plenty of the day left to go exploring . 9 of us regrouped at the cafe at which point the sun tried to break through & we considered going up in the ski lift to explore the views from the top but it lasted just a few minutes before the mist descended once again . 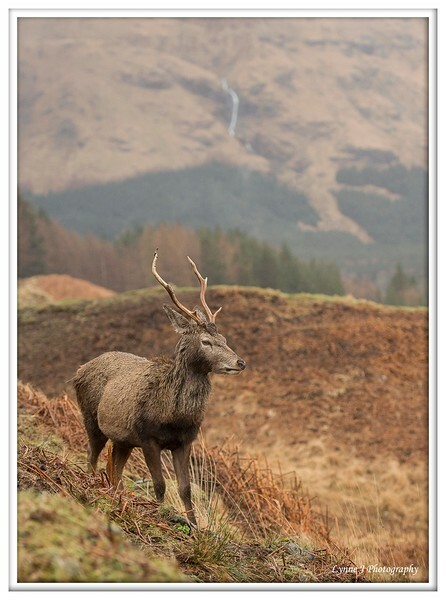 As we hadn't been all the way down the Glen Etive road we decided that was a good plan , plenty of possible locations along there & the chance to see the wild deer . 4 cars convoyed out of the mountain resort , back along the A82 & on to the Etive road which is a wonderful drive on , for the most part , smooth flowing tarmac , blind crests , sharp switchback corners all set in stunning scenery . We lost Dan early on , still not sure what he spotted , the rest of us continuing down to Loch Etive & on the way , my 1st chance to see a bachelor herd of deer . Being as quiet as possible I grabbed the camera with the 70-200mm & fired off a couple of record shots , the fencing in the background not being ideal but at least if I didn't see any more I'd have these images to remind me of how beautiful these creatures really are . A little further along we stopped again , this time using phone cameras as there were 2 young Deer sat quite still at the edge of the road . Loch Etive was not at its most photogenic so after a quick nosey abut we headed back up the road with the intention of stopping above Loch Urr & walking down the hillside for a few shots . We rounded a corner at the top of the hill to be met with a herd of Deer on our right just above the Loch & a conveniently placed layby , everyone pulled in as best they could which still left the road partly blocked ! The Stag looked us , apparently quite unconcerned by this group of people pointing cameras at him , Mark proceeded to lay down in the road & inched ever closer to him ( the things we do for a shot ! ) , moments like these make you glad to be alive & you forget about the less than ideal conditions . Having taken our fill of shots I set off in the lead , trying to keep my eyes on the road but struggling to concentrate as the road leads back through the stunning hills & valleys , we pass a few small holdings with folk chopping wood & going about their daily farm work & wonder just how amazing it would be to live here . I round another corner & there on my right , almost hidden from view are 2 or 3 Stags so I hit the brakes , kill the engine & ignoring the rain grab the camera again . The guys behind me had no warning & possibly couldn't see why I'd stopped so my apologies to them but this was a photo opp I couldn't miss . 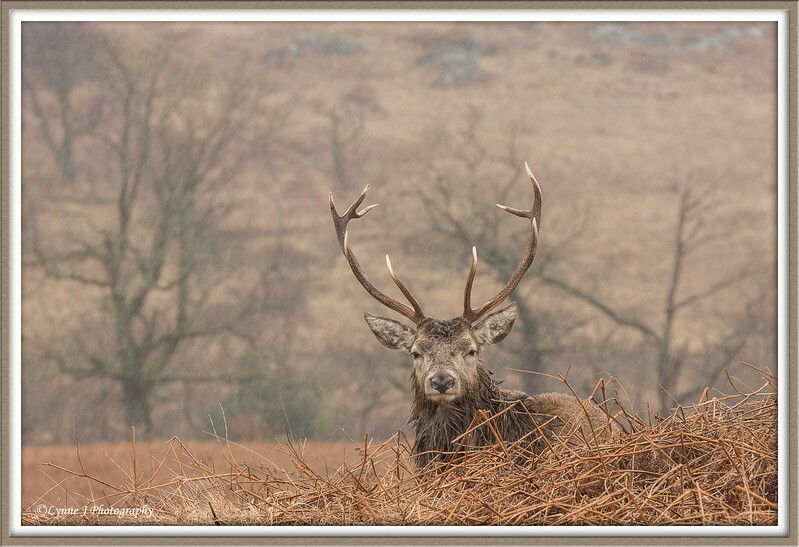 I crouched down & inched a little closer waiting for the Stag to look at me , I needed eye contact with him for this image & sure enough he looked at me just long enough to allow me to focus on his eye & take the shot . This is possibly my favorite image of the weeked , it has it's faults ( iso higher than wanted , f8 not ideal ) but I love it . We finally dragged our ourselves away from the deer , the clouds were gathering along the tops of the valley & it looked like heavy rain was heading our way . I took the opportunity to grab a handheld shot out across the valley & Loch Urr using the 10-20mm Sigma , hoping I could capture the atmosphere of the moment with the storm clouds rolling in over the mountain tops. Back on the road again as the rain arrived we passed the tree that held promise of a cracking shots but not in this weather & decided to stop at a water fall we'd seen about 4 miles further on. The rain passed & I spotted a small patch of blue appearing in the sky along with some decent cloud formations so Andy & I kept going in the hope that we could get a to the Buchallie before the next rain storm but as we neared the pull in we could see it wasn't to be so turned round & went back to the falls . A quick scrabble down the steep hillside followed by some precarious balancing on slippy rocks , frame up , shoot , then a scrabble back up the hill before the rain arrived again & I had a image I was happy with . Mark , Andy I stood gossiping from a few minutes about where to go next when I saw the tree at the edge of the road & thought it framed the view down the valley quite nicely so grabbed another hand held shot & , after processing it , am pleased with how it turned out . Time was marching on & tummys were starting to rumble so we headed off to Fort William for the group meal & with no time to go back to the hostel & change we had to hope the restaurant would let us in !. The meal at the Indian was a great way to end the meet , even if they served lemonade that was just soda water & couldn't tell the difference between Scampi & deep fried chicken balls......yes , I know it's an Indian restaurant but I don't eat Indian ! 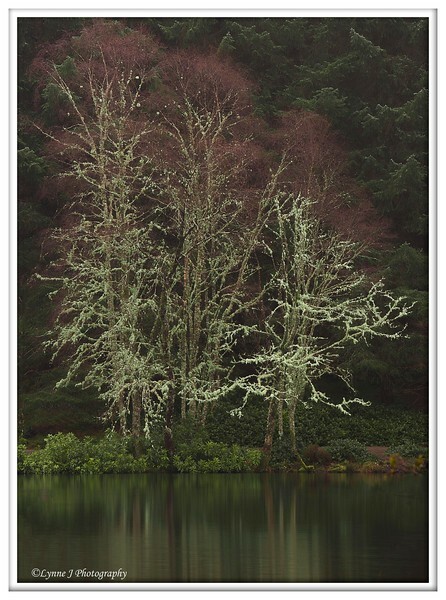 The next morning a few of us headed yet again to Glencoe Lochan but the conditions were wet...very wet but I still managed to get a single image . By 7.30am we were back at the hostel loading the cars & saying our goodbyes , some heading to the Kelpies , some with along drive ahead just going home , Andy & I were heading back to Milarrochy Bay in the hope of better conditions than the 1st visit . The rain started to ease & the sun came out as we pulled in to the Green Wellie services so it was a quick stop then back on the road with lifted spirits . it was around 9am I think when we pulled in to a totally deserted carpark at Milarrochy , we'd fully expected it to be full with sunday walkers & the like....most strange . Not wasting a moment we got set up for the shots we wanted , the sun was still out ,the water was covering the roots of the tree & clouds were scudding across the sky ,we really couldn't have asked for better ! We spent around 2 happy hours at the bay , using both the Tree & a small line of rocks as focal points & making full use of the Lee 10 & 6 stop filters . The clouds & misty rain finally came back & it was time to pack up & head for home although we were going to stop off at the Lake district for sunset of it looked promising . As it turned out we didn't get a sunset but it had been such a brilliant weekend we really didn't mind to much . There would be other times for sunsets in the Lakes .